Joel Pulley, a struggling comic book artist, has his narrow world turned upside down when an over-eager stray dog shows up at his door… repeatedly! This excitable canine is unwavering in his pursuit to be Joel’s best friend. And Joel, not exactly an animal lover, is just as unwavering in his attempts at getting rid of the dog, especially after a messy fiasco between the dog and Taylor, Joel’s shallow new girlfriend. It isn’t until the escape-artist canine is almost run over in the street by Monica, a vet, that things change… for everyone. She convinces Joel to adopt the dog, who is quickly named Push for being so pushy and determined. Soon Push pushes Joel’s life in fresh directions. 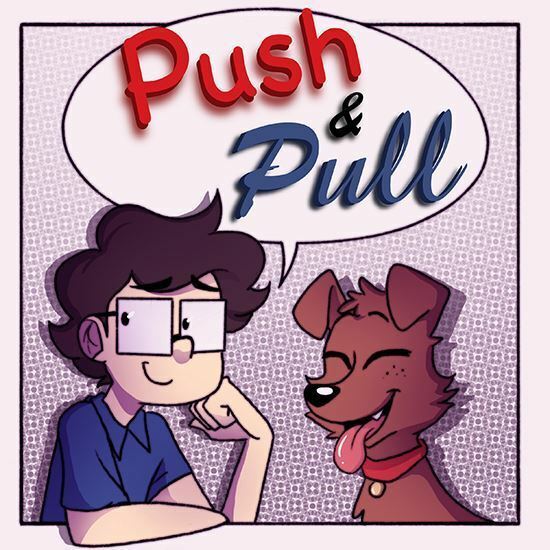 Joel finds success through his new comic strip “Push and Pull,” and with Monica, he finds a happiness he never knew. Push, of course, loves Monica, her cat, and especially the cat’s pungent-smelling litter box! Told through dialogue and the comic visual art Joel creates, this one-act is both playful and poignant. It shows us the life of a dog, and the human lives the dog helps to shape into a family. Approximately 45 minutes. Enhance your production with 22 original images. These images are in a comic book style and can be projected during your performance. This artwork helps to tell the story of Joel’s life and aid in scene transitions.